Ufuoma Famous: My name is Ogaga Ufuoma Famous, the third child in a family of four, I was born and raised in Benin City, Edo State. I returned to my state of origin, where I had my tertiary education in Biochemistry from the prestigious Delta State University, Abraka. I answered the clarion call in 2016 and served in ancient city of Ibadan, Oyo State. My passion for knowledge has led me to obtain certifications in Human Resource Management, Project Management, Health Safety and Environment and Basic First Aid. Olije Dominic: My name is Olije Dominic Isioma, I am the first child in a family of six, while growing up, I used to make touch lights from scrap materials, also motor fans, it used to amaze people around me. I had always thought myself to be an engineer at first because of what I found myself doing at that young age, but also I loved the idea of saving lives medically so I decided to study a course in the medical sphere. I am a graduate of Biochemistry from Delta state university. How has She Hacks Africa training impacted your career? Ufuoma Famous: In this age where computer utilization is fast becoming a requirement for a successful career, my training at She Hacks Africa, helped put answers to my curiosity. I am grateful to WAAW foundation and Act foundation. As I have always been fascinated by computers, how they work, how websites are built and how they function in general, the training was mind bending and impactful. All the sessions were impactful, from the web development to the sessions focusing on entrepreneurship, leadership and innovation. I went to She Hacks Africa to learn programming, I came back transformed and empowered on all grounds, computer programming included, ready to face new opportunities. Olije Dominic: I got to know about she hacks from a friend who participated in a previous cohort, and I knew it was time to embrace engineering again. She Hacks Africa has helped me start a wonderful journey into becoming a great Nigerian developer, I got my first real job (job I liked) less than a week after participating in cohort six. I keep thanking that friend, and also the organizers of this program everyday. You work at Re:learn, how are you applying the skills learnt at SHA at work? 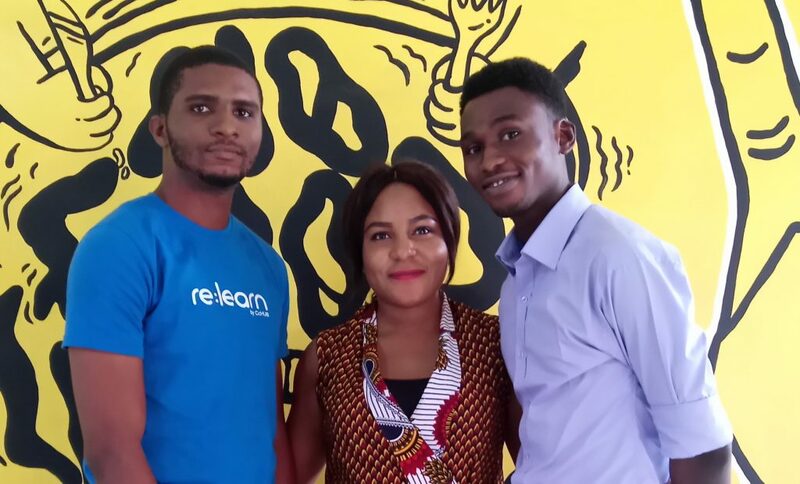 Ufuoma Famous: In my current work at Re:learn, I have been able to walk the path of a social entrepreneur, just as we were taught in the bootcamp. The ability to empower younger generations with the knowledge of the computer, improve the society and make money while doing that. The knowledge of computer programming has also come in handy at different times at work, getting to share ideas and engaging in interesting conversations and work, with other team members to achieve goals. What do you do at re:learn? Ufuoma Famous: At Re:learn I am a STEM Facilitator. This means I get to help younger generations (school students to be specific) understand how Science, Technology, Engineering and Math are useful to our everyday lives. By presenting them with simulations which help to make the topics taught at school come alive. It’s interactive based learning, different from the traditional teach based learning. It’s learning made easy, simplifying the sciences and helping students figure things out while working with the computer. I also teach coding to kids during the yearly summer of code program. Olije Dominic: Re:learn, an arm of Co-creation hub, that teaches young ones smart ways to learn STEM. Being supported by various educational platform like golabz, re:learn helps the education sector by further teaching students in various schools STEM using technology (online simulations). I work with re:learn as a technical educator. We also have programs that teach people how to code online and offline. Ufuoma Famous: She hacks Africa has greatly contributed to my success at work. It laid the foundation on which my confidence and experience as a computer programmer is built. In my personal non-work related projects the ideas and information from the bootcamp has greatly been beneficial. Olije Dominic: The good thing about my time at SHA was that, I just didn’t learn how to code alone, I also learnt how to work with others, how to be a leader even in times of complications, and I can beat my chest that my colleagues at re:learn can attest to this. Is their anyway you planned on giving back to She Hack Africa in the future? Ufuoma Famous: On a personal note I look forward to having She hacks Africa as a partner in my projects that involve empowering young people, and to support in ways I can if my assistance is needed at any time. On the other hand I will try to use my influence to get She hacks involved in any opportunities I am opened to, that I know will be of great help to the She hacks community. Olije Dominic: SHA has really done a great thing for me, and I believe I can only repay them by being a successful developer, so that together we can do and achieve more. What advice can you give the upcoming She Hacks Africa participants? Ufuoma Famous: My advice to upcoming She hacks participants, take the chance it’s worth. I had to make sacrifices to get the little commitment fee and today, I have benefited more from that little commitment than I would have ever imagined. It’s worth it. Coming to class, participating in all the sessions, coding and non coding session alike, you will thank yourself later, trust me. Finally I want to say a big thank you to the Facilitators for the good works you did, you are all jewels of inestimable value. I am grateful, thanks for the opportunity to learn from you. Olije Dominic: My advice to upcoming she hackers is don’t take what you learn lightly, and you would be proud of yourself, also know that you would need to put in extra work, and you will be fine. Thank you SHA, thank you cohort six, thank you to all my beautiful educators at SHA. We would do bigger things in years to come.